» Skytag v. Los Angeles: Did Sign Company Submit Phony Evidence to Federal Court in Quest For Injunction Against the City? Skytag v. Los Angeles: Did Sign Company Submit Phony Evidence to Federal Court in Quest For Injunction Against the City? On Jan. 5 of this year, Domingo Sauceda looked out the window of his office on West 7th St. in downtown Los Angeles and saw what he thought was window washing equipment being hung from the south side of the Mayfair Hotel a block to the west. However, it became apparent that instead of the windows being washed, a 10-story high supergraphic sign depicting the statue of liberty was being applied to the building. Sauceda happens to be the director of enforcement operations for the Los Angeles Housing Department, and according to a court declaration he immediately notified the city’s Department of Building and Safety. An inspector went to the site and after determining that the sign was installed without a permit and violated a 2008 moratorium on new supergraphic signs, an order to remove the sign was issued. Further enforcement was suspended, however, when the company that put up the sign, Skytag, Inc., succeeded in getting a federal court judge to issue a temporary injunction last spring and discharge the citation. Five months later, the company filed a motion with the court seeking to permanently bar the city from any enforcement against the hotel supergraphic and signs at 20 other locations throughout the city. Submitted with that motion was evidence purporting to show that all of the signs were put up before the Dec. 26, 2008 effective date of the moratorium. 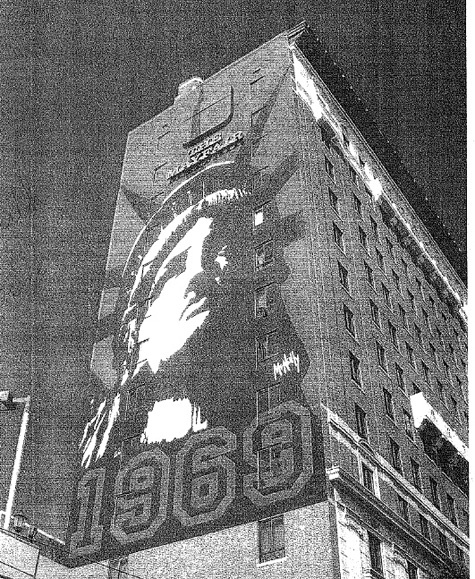 For the Mayfair Hotel supergraphic, that evidence included a declaration by a man named Andres Garcia, who was identified as a “principal and/or employee” of the property owner, along with a photograph purporting to show the sign in place and complete on Dec. 25, 2008. However, a photograph taken by the city sign inspector who went to the site on Jan. 5 shows the sign in the process of being installed. Another sign inspector went to the site on Jan. 8 and photographed the completed sign. That photograph was compared to the photograph submitted as evidence by Skytag, and according to sworn declarations by the inspectors, differs in significant ways. Which prompts the question: Did Skytag submit a fake photograph to the federal court? Skytag’s owner, Michael McNeilly, is no stranger to such controversy. The federal judge in the case, Audrey Collins, has several times questioned McNeilly’s credibility in assertions made about the location and number of supergraphics the company has put up around the city. 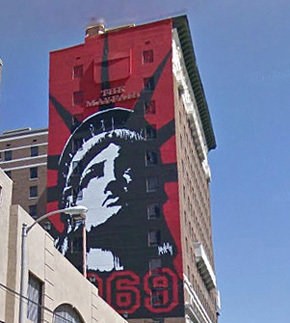 McNeilly has claimed that the multi-story statue of liberty images are artistic expression protected by the 1st Amendment, although some of those images have been subsequently replaced by ads for commercial products and services.